Craving chocolate? 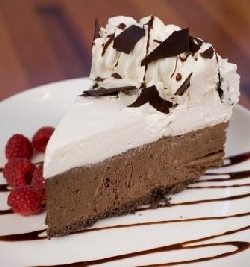 This homemade chocolate mousse pie recipe from scratch is the bomb. It's a easy dessert recipe, that will soon become you and your family's favorite. To make the crust, combine the crushed cookies and melted butter together in a bowl and mix well. Spray the pie plate with oil and using your fingers, press mixture into the bottom of your pie plate. Bake for 5 minutes and cool completely before filling. Combine the chopped chocolate and salt in a small bowl. In a saucepan add 1 cup of the heavy whipping cream; bring to a slow boil. SLOWLY add the chopped chocolate mixture and mini marshmallows; whisking until it is melted and smooth. Pour this in a large bowl and cool to room temperature. Beat 2 cups of the heavy whipping cream and 1/4 cup powdered sugar in a bowl until it forms high peaks. Fold this into the cooled chocolate mixture and pour into the cooled Oreo crust. Chill for a minimum of 6 hours; overnight is best. Before serving, beat the remaining 1 cup of cream until it forms high peaks. Add one teaspoon of vanilla and add 1 TBS of powdered sugar. Spoon over the pie and swirl with a tablespoon to decorate or use a straight knife to smooth the top of the whipped cream layer. This is heaven on a fork, trust me.